My prefered solution was to use the Maven ‘update snapshots’ command line argument. 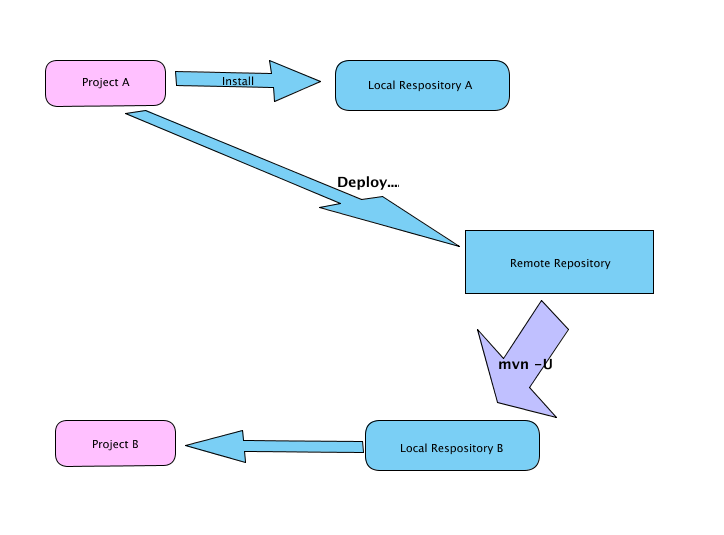 More recently I was working on a project that was organised slightly differently and which relied heavily upon a company wide Maven “remote” repository. The idea here was that developer A worked on Project A. When he/she was happy that the code was okay, it was deployed to the repository for use by other developers. So far, so good. Problems arose when Maven snapshots were used and the snapshot artefacts were modified often. Developer A would build their project and deploy it to the Maven repository as a snapshot. Developer B would need this latest update for their project, but their build would fail as the required JAR was not automatically downloaded from the remote repository to their local repository and they would be stuck with an old build. The cause may have been a problem in the way the repository was configured, or a bug somewhere, or even the way Maven is supposed to work, but the fact that developers couldn’t automatically get hold of the right versions of artifacts did cause some unnecessary aggravation and lost time for all concerned. The fix is, once you’ve discovered it, simple. You can either delete your local repository to force its rebuild, or you can start using proper Maven version numbers instead of snapshots and do the versioning yourself. This is more effort than it’s worth as developers have to talk to one another, sending out unnecessary emails etc. Once added, this command line arg forces Maven to check all snapshots in a remote repository and update your local repository if it’s out of date. 1The remote repository in this case was Apache Archiva although I prefer Artifactory.